Place paper liners in 9 cups of muffin pan or grease cheesecake pan. Divide between the cups, pressing gently to flatten. Move 1/3 of cheesecake mixture to a seperate bowl. Add pumpkin and pumpkin pie spice to seperated mixture and stir until blended. Spoon plain cheesecake mixture into the lined cups to about 1/2 - 2/3 full. 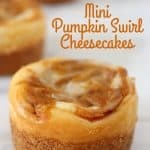 Put a tablespoon of pumpkin cheesecake mixture into each and gently swirl with a toothpick or knife. Remove from pan and refrigerate at least 1 hour.